Adam and I took a road trip up to Norman, OK this week to visit my sister. I was so worried after the car accident that he would never want to be in the car that long but he was awesome! He has been getting in and out of the car without issue and is never bothered by passing traffic when he’s in the car. We had semi trucks behind us and he wasn’t fazed. He’s come such a long way! There were days after the crash that he barked at every car behind us and would tremble in fear. The car is a happy place for him again! We are not quite ready to walk down Marsh, but we have made a lot of progress! I can even walk in a pretty straight line now. I really wish the rain would go away so would practice even more! Adam hasn’t been barking at cars or running to get away from them anymore but is still focusing on them more than he used to. He’s been mostly ignoring car sounds on TV, too. I felt so hopeless after our crash that my dog, that once loved going everywhere with me, would have to stay at home and avoid the car-filled world. I cannot thank you enough for guiding us through this and helping him become his happy self again. I’m excited to send you another update of us walking down busy roads. I hope you and Barbara are doing well! I just wanted to thank you and Barbara again for your help, professionalism and hospitality. I also wanted to say that I am truly thankful for your ability to read the situation not only with Zoey, but with myself as an owner - this is not a talent most people have. Also, you have been able to give us the confidence to accomplish what I thought was impossible! We have been practicing and are so thankful for your help! I just wanted to say ‘thank you’ again for your help with my little Gracie. I am diligently doing my best to follow and implement all the structures and rules you taught me, and am already seeing BIG changes. I truly do feel that you were a Godsend, and will always be eternally grateful to the Lord for leading me to you and for the amazing help you gave me. I really don’t know what I would have done if it hadn’t been for finding you. You do very important work, and you do it absolutely expertly! I really don’t know what else to say, but from the bottom of my heart, thank you. Just a quick update on Miss CoCo. We have relocated to Dubai and she made the journey with us (sadly dogs and cats don’t get air miles). So from being a fearful, unsure of herself pooch with separation anxiety, we have gotten to this stage (pictured) of how we are greeted when we’ve been out of the house for a few hours. It’s been a long road and there have been times when I didn’t think I’d get it, but we stuck with using the tools you gave us and we now have a great dog. Once again thank you for everything. We just wanted to tell you that our Dugun no longer barks anymore when we leave because of separation anxiety; one time he didn’t even look our way was as he was too busy chewing his bone! Hey Scott, hope you and Barb are keeping well. Just a quick update on Miss CoCoBa. She has come around in leaps and bounds. She takes herself off to her crate on the upstairs lounge to chill out for a few hours. We are now able to leave her loose in the lounge if we are working in the garage with no protesting or destruction. We’ve built up to leaving her in the crate for 6 hours and, despite her excitement, will sit within 5 seconds of us walking in and understands affection only happens when there are 4 on the floor. Thank you so much for the invaluable tools, tips and training you’ve given to Frankie and I. I am much more prepared to respond appropriately to Frankie than I was before we met you. I’m more confident that I’m making the best choices for her and the other dogs. Frankie has made so much progress since I found her, but I’ve seen even more improvement since we started training with you. I just wanted to thank you again for all your help with Finnegan. We’ve made tons of progress on meal-time, and now Finnegan and Hamish are eating in the same room without any trouble. We appreciate your help - we’re seeing a marked difference in how our boys behave. They’re much more at ease now than even a few weeks ago. We have been able to translate what you did for us into our everyday interactions with both of our dogs. The tools and training you provided are sustainable because you took the time to understand and assess our family and the dynamic (i.e., two teenagers that can undo training and definitely create inconsistency). I so much appreciate that your training and methodology were specifically tailored to our dog, Roman. It didn’t bully or intimidate; it worked with his giant but gentile nature and did not break his spirit. He responded so very well, likely because you spoke in his language and dialect. Roman is doing great. The “go to mat” cue is our favorite and most frequently used. The loose leash walking is still a work in progress. 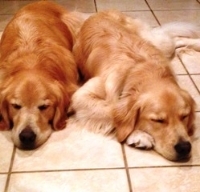 We contacted Scott after our 12 month old Golden Retriever ate our Loveseat and started acting aggressively toward our three year old Golden Retriever. Scott immediately helped us differentiate between “bad aggressive behavior” and “positive playful behavior” and taught us ways to help teach and reward desired behavior versus only reprimanding them when they do something that is unacceptable. His manner with the dogs was firm yet always gentle and he always showed great respect and care for the animals. With us (the ones really being trained! ), he was clear in his direction, gave us context as to why he was doing certain things and gave us real time feedback and support as we practiced. 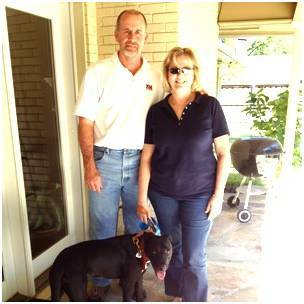 Our VCA veterinarian highly recommended Scott’s services to help us with our new family member, Blue. 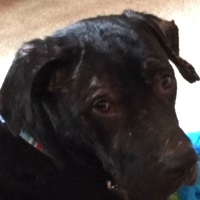 Blue is 1.5 year old male Australian Shepherd/Lab mix. My wife and I adopted him from the Dallas SPCA about 8 weeks ago. Blue was a bit anxious in his new home and he had some habits such as counter-surfing, trash-hounding and rambunctious manners. Scott came to our and Blue’s rescue and after only three in-home sessions, over about 4 weeks, Blue has shown remarkable improvement in all areas. Scott made the sessions very informative and fun for us and Blue. After the first session we had a doable plan that we were able to immediately start with Blue, which also produced immediate results. 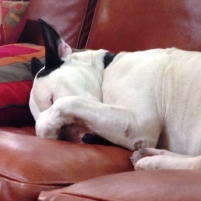 I’m Gus - a 60 pound 20 month-old Bull Terrier (you can see some pictures of me on the left). After being in rescue for 8 weeks, I was adopted by people who had just lost their 16 year-old Bull Terrier. Boy was I scared. They expected me to behave just like their old Bull Terrier. And I was really uncomfortable. I tried to lick them a lot, jump in their laps and jump up on them. I guess they didn’t like it because they sure were stern with me. All I was doing was saying hello and telling them how much I wanted to be part of their family. That’s where Scott came in and saved the day. He quickly figured out what I wanted and what my people wanted and immediately started to turn things around. We worked together on lots of skills – loose leash walking, front door manners, stay, sit, come, down, good boy and “hey”! I even know which couch I can nap on – and, which I can’t. But, most of all I’m no longer scared. I overheard people talking the other day and they said I was part of the family. This is my forever home and they are my people – Woof! I very much enjoyed the training class and appreciate the care and effort you and your wife put forth towards helping these precious animals. The tools I’ve learned have made a huge impact already with my dog, and I know with continued practice things will just keep getting better. Your openness and willingness to address questions are also invaluable. I will be extending what I’ve learned to try and help train dogs at Operation Kindness when I volunteer. Just wanted to let you know how happy we are with Chip and Rowdy’s recent training. The change in behavior has been dramatic, and we now feel we have the tools to work with them and improve our relationship. Our Jack Russell Terriers are so smart, and with effective communication and understanding of their needs, we feel we have enhanced all of our lives. “The boys” seem so much more at ease, and we have a very happy home. We owe that all to you. Thank you again for the patient instruction, flexible training schedule and awesome personality. It was truly a great expericence, and look forward to working with you on some advanced training for Rowdy in the future. I found my dog, Max, from Operation Kindness as a very young puppy. He has the personality of loving everyone (wanting to be petted) and every dog (wanting to play). This behavior got out of hand. When someone (friends) would come to the door, he would get excited and jump on the visitor and other bad acts. Totally out of control. At 8 months old - I knew I had to do something. I found Scott from the Operation Kindness web site and visited his web site and thought I would give him a try. Scott came over to my house and I did not try to stop Max. Scott later said it was about the worst greeting behavior that he had ever seen and I tend to agree. Scott did a great job. Max stopped jumping on visitors after 2 sessions with Scott and after the 3rd session would go to a pad on command and wait for the visitor to enter and would wait for them to invite him. Scott completed what I wanted after 3 sessions and the training for now is complete. 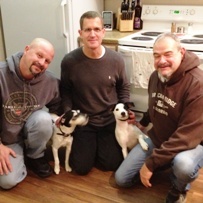 He did a great job and I highly recommend Scott for your difficult dog training problems. Scott, we enjoyed working with you. You quickly diagnosed our dog’s problem and provided us with a clear and easy to follow remedy. In just 3 sessions with you we moved forward and now it’s just a matter of follow-through on our part. So far everything is going very well. Thanks for your help. FYI, we will be recommending you to other dog owners. 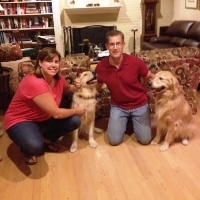 About six months ago our family rescued a five-month old female German Shepherd (Maddie). We were already an owner of two other German Shepherds and were sure our experience would allow us the opportunity to adequately help this beautiful puppy integrate into our family life. Maddie proved to be a handful and progressively became uncontrollable around other dogs showing “dog aggressive” traits. We were lost! We would like to express our heart-filled thanks to you Scott! You are an incredible trainer with lots of patience and kindness which was demonstrated as you helped prepare me in changing Maddie’s behavior. Your knowledge and professionalism allowed, after just a few training sessions, the ability for me to learn several techniques for correcting Maddie’s behavior. Maddie now passes by other dogs without exhibiting sheer aggression and it allows us as a family to be less stressed and confident in handling her to adapt to changes as they arise. We highly recommend you to anyone! Our experience was rewarding and you have the upmost respect from both Maddie and our family!